You either like Ace Ventura or you want to entrap him in a space capsule bound for the heart of the black hole at the center of the Milky Way. If you are of the latter persuasion, don’t read on. It will only prompt you to spend inordinate amounts of money on the space program to construct that black hole-bound capsule. Jim Carrey once again tears comedy a new black hole as pet detective Ace Ventura in ACE VENTURA: WHEN NATURE CALLS, the Hawaiian shirt-clad sequel to his breakout ACE VENTURA PET DETECTIVE. More muttonhead insanity for muttonheads. That doesn’t mean this sequel isn’t as bold, brash and bountifully braggadocio as its predecessor; a riotous laugh-a-minute wild kingdom zoo train (but see disclaimer above). Ace is called out of retirement by an explorer (a game Ian McNiece), to travel to Africa and locate a missing sacred white bat, which will avert war between two tribes. Along the way, he engages in a loogie-fest with the Wachati tribesmen, a test of manly skill with their opponents, the Wachootoo tribe (featuring Tommy Davidson as a maniacal little tribal warrior), is birthed naked by a robot rhinoceros, wrestles a crocodile, is forced into a Wolverine hairdo, deflowers a forbidden virgin tribesgirl, uncovers the whitey corporate plot (with Simon Callow as a contemptuous upper class Brit), and once again talks through his arse. It becomes obvious from this movie that Jim Carrey’s inimitable performance in ACE VENTURA was no fluke and that his star rising was no accident. Seeing him in action, we realize that the White Boy from IN LIVING COLOR has become a dynamo force of nature that no vagaries of the industry could have stopped. Physical comedians Buster Keaton, Charlie Chaplin and Jerry Lewis were from an age long dead – the world was hungry for the next larger-than-life King of Comedy. 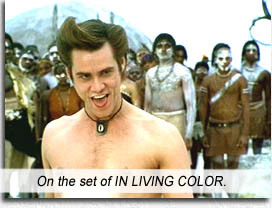 Unlike mundane “comedians” like the Ray Romanos, George Lopezes and Larry The Cable Guys (who rely on writing, direction, editing, soundtrack, to convey their stunted comedic stylings), Carrey is able to turn mundane writing and storyline into a visual hurricane of ideas and kineticism, aware of every muscle in his body during every moment of screentime, ever driving to squeeze the last iota of juice from his performance. It is not that he is bombastic – of course he is, that’s Ace – but that he can imbue that bombast with such creativity. Underneath it all, WHEN NATURE CALLS is a call to nature – the message of conservation spears home loud and clear. You Earth faddies should love that, right? No matter what you may think of Jim Carrey, he opened the way for a new strand of physical comedy, the likes of which Will Ferrell and Rob Schneider and Jason Biggs should be eternally grateful. So before you even speak of that black hole, deal with that black hole speaking…. Writers: Jack Bernstein, Steve Oedekerk. Starring: Jim Carrey, Ian McNiece, Simon Callow, Maynard Eziashi, Bob Gunton, Sophie Okonedo, Adewale Akinnuoye-Agbaje, Sam Motoana Phillips, Arsenio Trinidad, Bruce Spence.